Thus said Saved by the Bell Promotion president and Batangueño sportsman Elmer Anuran as he explained the driving force in his belief that Bernabe ‘‘Real Deal’’ Concepcion remains a world title prospect. 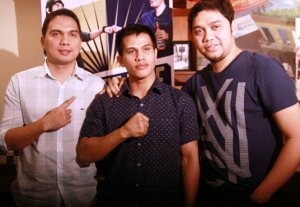 Anuran, Ryan Gabriel, manager of the 26-year-old Concepcion, and the ‘‘Real Deal’’ himself guested in the Philippine Sportswriters Association Forum last Tuesday at Shakey’s Malate. Concepcion, once the toast of Philippine boxing, recently joined the growing stable of Anuran’s SBB. The native of Virac, Catanduanes said he is very thankful for Anuran’s support as he tries to find his way back to the difficult world of boxing. ‘‘I’ll do everything to win the world title. With the help of God, Boss Elmer, my manager Ryan and those who believe in me, I know that I still have it to become a world champion,’’ said Concepcion, who sports a 32-6-1 win-loss-draw record including 18 knockouts. ‘‘SBB will revive the career of the ‘‘Real Deal.’’ He needs more exposure and with his inborn talents, he can still make it to the top,’’ said Anuran, also owner of the Touch Gloves Boxing Gym in Agoncillo, Batangas. Anuran said he is looking at a fight on January at Camarines Norte to coincide with the birthday of youthful Governor Migz Villafuerte, who has an aggrement with SBB to popularize boxing in Bicolandia. ‘‘We need to get him (Abe) into the ratings game first,’’ said Anuran. Both Anuran and Gabriel said they respected those who said that Concepcion is no longer capable of bouncing back from a career marred by unfortunate events including his bout against Steve Luevano in 2009 at the Hard Rock Hotel and Casino in Las Vegas, Nevada. ‘‘acting’’ Luevano when the bell ended in the seventh round. Concepcion gamely recalled what happened.‘‘Truth was, I didn’t hear the bell. But it happened already and I already learned from my mistakes. I vowed to be very careful,’’ said Concepcion. Abe’s was the ‘‘Real Deal’’ when he downed the ‘‘invincible’’ Puerto Rican Juan Manuel Lopez at San Juan, Puerto, Rico. Juanma managed to recover from the first round knockdown and went on to win the bout but world learned of Abe’s power. That power, according to Anuran is still evident. Anuran liked what he saw after watching Concepcion slugged it out with world class Eden Sonsona in Mandaluyong City. The bout ended in technical draw after a headbutt which bloodied Concepcion eyebrow in the third.